“Fear” — even the word makes some people twitchy. Recent research in neuroscience has told us a lot about why some people become extremely nervous and worried before the swim. Most people’s brains on race day are like an unruly school playground. All the main characters are there: the show-offs, the bullies, the shy kids, the nerds, and a bunch of other kids just trying to make it through another day. The same is happening in your brain on race day. Different parts of your brain start fighting for control. If we simplify the science, we can think of your ‘swim fear’ as a battle of six regions in the brain, each with different priorities come race day. Here’s a cheat sheet about how to take back control of your own brain: You see the problem? You have six brains in a fight. One of them has got to get control. We’re hoping the one who wants to punch the offending swimmer doesn’t get control. Sometimes the socially acceptable but devious brain (#2) takes charge by saying “Three strong kicks to the mouth should do it!” Sometimes the rational frontal cortex brain (#4) takes control and says “I’ll just swim 2 feet over to the left and all will be fine.” Depending on your personality, the brain left holding the reins is likely to vary. Regardless of the outcome, you can see how very complicated this all is. As a triathlete brain-trainer, I’m just trying to help you cope with staying calm and efficient during an open water swim start, and this involves making all six brains work together. Stop avoiding things that scare you and instead confront them head on. Not swimming in open water, not practicing swim entries and exits with others, not entering a race because the surf is usually big, not moving up a lane at masters when you should all make paranoid Brain #1 even stronger (in science speak, synaptic strengthening occurs). You’re left with too few experiences to draw on in which things went ok (you lived) or even felt great. It’s a cliché, but the magic really does happen out of your comfort zone. Ease your way into stressful situations by simulating the problem first. The bike stationary trainer and treadmill remain fundamental training aids for the bike and run, yet so few triathletes see out complementary training aids for the swim. For example, swim trainers and ergometers are incredibly useful tools to work on technique and race simulation sans the anxiety and/or boredom. Short, high intensity power intervals help prepare you for swim starts, and longer sets with video feedback from a camera phone help identify when your technique starts to break down. In addition, without the confusing and disorienting presence of water, a Vasa Ergometer enables you to more easily focus on critical technique cues such as your high elbow catch, engagement of the lats, power in the catch phase, and follow through to the hip. Record bilateral watts and add a mirror beneath you to get precise and immediate feedback about subtle changes to your stroke. Picture yourself as an outsider, as though you’re watching someone else look nervously at the water. What advice would you give them? One of the biggest misjudgments that people make is mistaking a failed plan for a failed person. Plans fail. Actions fail. People are not failures. The critical point is what we do with our failed actions and plans (or the thought of failure). Mental toughness is built by enduring in the face of failure, it doesn’t come from an easy swim during taper week. In a comfort zone-busting new experience, force your goal to be something you are always in control of. When the goal is under your control, you always get to define success and failure. The best goal is based on the effort you plan to give, not the time it takes you, where you finish, or how others see you. Start every new swim with this simple pledge: “No matter what happens today, I agree to give it everything I’ve got given the circumstances.” You might be unfit or under prepared, you might get your goggles knocked off, or be the slowest person in the lane or wave – these are all your ‘circumstances’ – but they have no bearing on the effort you give. If we let our fears and concerns linger long enough, we can become paralyzed by them, unable to make a decision. Sometimes, it’s good to be impulsive. Go on I dare you, make a quick decision about something scary in the future, whether it’s entering a certain race known for big surf or signing up for master’s swim. Recognize that feeling overwhelmed by fear and anxiety about the swim simply means that your brain has been hijacked by the part of your brain trying to keep you alive (Brain #1). Brain #1 is irrational, paranoid, very emotional, and thinks catastrophically. It’s one of the oldest parts of your brain and is the source of the fight-or-flight response and the fountain of all instincts, drives, and pleasure. Evolution has given it incredible powers, like the ability to receive and process information much quicker than the rest of your brain, and the ability to throw a chemical brick at your rational brain to stop it taking ‘over thinking’ when your life really is in danger. Dr. Steve Peters, the British sports psychiatrist, calls this region your “Chimp brain” because it’s prone to tantrums and acts like an immature primate. To regain composure and enjoy yourself, you need to take back control. After all, it’s only a triathlon. Rather than telling your Chimp Brain to shut up (it won’t work, it’s much stronger than you), try doing the exact opposite. Let it have 2 to 3 minutes of uninterrupted ranting. By letting it say all the things that it hopes will persuade you to pack your bags and go home, it will start to calm down. After all, everyone likes feeling listened to. “I’m going to come out of the water last. I’m going to get pushed under by those big waves. A shark is going to eat me. People will think I’m a joke. I’m not a real athlete. Everyone is looking at my fat legs.” And on it goes. Don’t interrupt your chimp. Let it rant until it runs out of insulting and scary things to say. Remember, it’s not the “real you” talking, it’s your Chimp using tricks to get you to quit. Be prepared and find a way. 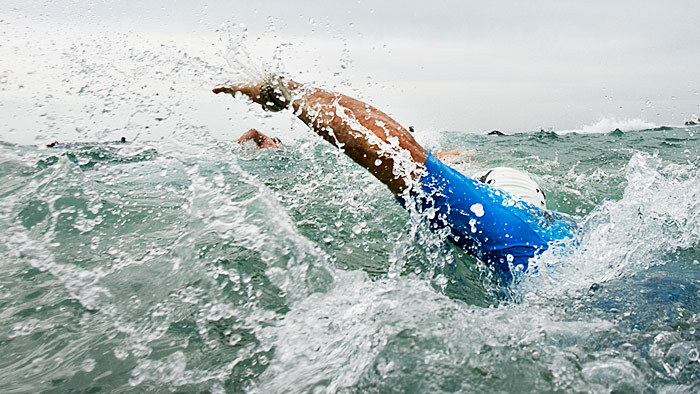 I’m amazed at the number of triathletes for whom the swim is their weakest discipline, or who are terrified of ocean starts, but never actually practice or simulate race conditions. Inconsistent swim training has a cascading effect on your physical, technical, psychological and emotional readiness to race. If you don’t live near an open water location or your schedule prevents you from getting to the pool enough, get creative. Why not invest in a swim ergometer and bang out intervals in your garage? Swim Ergs have the added advantage of providing data on your stroke (e.g., power, cadence, stroke length) and enable you to do very specific upper body resistance work to reduce deficits in your wet swimming. In addition, get a group of tri club members to meet you at a local OWS location and practice race-simulation entries and exits – complete with body contact, drafting, and mishaps. Dr. Simon Marshall is a former Category 1 road cyclist, a current age-group triathlete, and an international expert in sport psychology and mental toughness. Simon has a BSc (hons) in Sports Science, a Master's degree in Kinesiology, and a Ph.D. in Sport & Exercise Psychology. From 2002-2012 he was a tenured professor of Sport Psychology at San Diego State University before becoming a Professor of Behavioral Medicine at the University of California, San Diego. He has published over 90 academic articles about the science of behavior change. In 2014 he left academia to have more fun and focus on the brain training of endurance athletes. Simon is also the husband of Lesley Paterson, the 3-time World Champion in off-road triathlon. Together, they run Braveheart Coaching (www.braveheartcoach.com) and Team Braveheart, a Clan of like-minded triathletes, runners and cyclists who juggle busy lives while also striving to be fast, happy, and mentally tough.